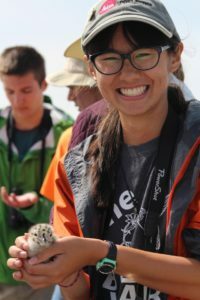 MYBC, in conjunction with York County Audubon and Friends of Hog Island, is sponsoring two scholarships for Coastal Maine Bird Studies for Teens. This intensive 6-day, 5-night program on Hog Island allows enthusiastic young birders to work with some of the country’s best-known birders and ornithologists on field identification, bird ecology and conservation. This program includes the unique opportunity to see Audubon’s seabird restoration work in action, and visit Eastern Egg Rock during the puffin breeding season (weather and sea conditions permitting). The program runs from June 16th to 21st. The scholarships will pay 80% of the recipient’s cost for program tuition, room and board. Additional funds may be available if an applicant demonstrates financial need. Applicants must be 14-17 years old to attend.